By FFWPU Zambia, Fabrice Djimadoum: FFWPU Zambia held one day seminar and kickoff of Heavenly Tribal Messiahship on Sunday, 26th September 2015 at Barlastone Training Centre, Lusaka. 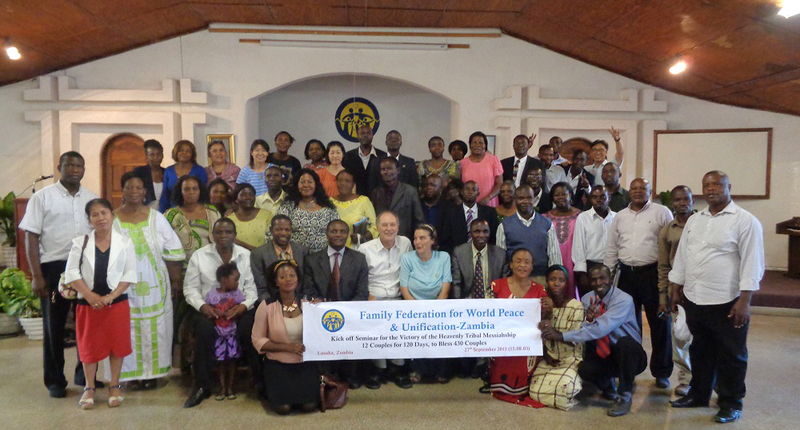 Around 80 participants from within Zambia, Zimbabwe represented by the FFWPU Zimbabwe president, Rev. Bosako Iyolangomo and Botswana by FFWPU Botswana President, Rev. William Chimfwembe. The workshop started with True Parents video following welcoming remarks given by Rev. Rudolf Faerber, Zambia president of FFWPU Zambia. The workshop and the lectures were guided by Rev. Mwalagho Kililo the East Africa Sub-Regional Director. The purpose of the workshop was to give more information, inspirations and testimonies to the Tribal Messiahs and to kick off the activities of 120 days when at least 12 Tribal Messiahs should determine to reach the goal of witnessing and to bless 430 couples. Rev. Kililo gave reports of activities he attended while he was in Korea during True Father’s Seonghwa third anniversary commemoration and different events. Participants had a chance to listen to testimonies from Philippines, Nepal, Thailand and Brazil where there have been a success in Heavenly Tribal Messiahship. After the lectures given by Rev. Kililo, participants were divided into groups of 4 to discuss on how to be successful in Heavenly Tribal Messiaship. After discussions, a representative from each group was asked to present their reports. Afterwards, Rev. Kililo summarized their proposals and gave guidance and there was positive debates on how to successfully fulfill their goals of 430 couples in 120 days. After the workshop, all the participants were asked to make a new determination to fulfill their goal of 430 couples and Rev. Kililo asked them to write their action plan. The workshop came to a close with a unison prayer followed by a powerful 3 cheers of Eog Mansei. All the participants were moved through this workshop deeply and they all determined to work hard and fulfill their goals.